The capacity to imagine and articulate exciting future possibilities is the defining competence of leaders. It’s also the toughest of all skills for leaders to learn. 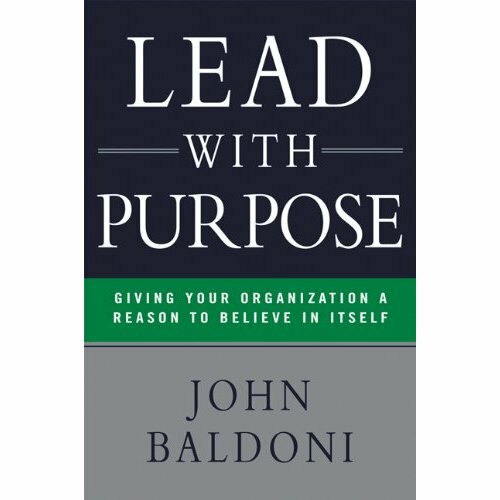 That’s what makes John Baldoni’s new book, Lead With Purpose, so vitally important... John writes with elegance and ease about the solid evidence, valid principles, and practical ways in which real-life leaders bring purpose to life. I highly recommend that you make this one of your must-read books of the year. At its core, any organization is a community of people with unique talents, perspectives and ideas. United by shared values and defined vision -- and with a purpose-driven leader at the helm -- there is no limit to what that community can accomplish. Without a doubt, this book will help you reconnect to your own purpose and be a better leader for it. Ask any leader: What would you give to have an entire company full of committed employees willing to go the extra mile? For all your people to work together as a unified force, knowing exactly what they do, and why they do it? Featuring illuminating stories, interviews, and profiles of leaders from a variety of fields, Lead with Purpose shows readers how to take their organizations to the next level with renewed focus and improved direction. Lead With Purpose: Giving Your Organization a Reason to Believe in Itself provides time-tested methods for ways leaders can unleash the power of their employees to achieve sustainable business results. Lead With Purpose provides a path for those who seek to provide clarity to their organization so that individuals have the desire and the freedom to create, engage and innovate. Lead With Purpose is shaped by first-person interviews with thought leaders and CEOs in multiple disciplines. It also features survey research of managers and employees conducted especially for the book. Reading Lead With Purpose will provide managers with a "pick-me up" in the form of fast acting advice they need to face the challenges of everyday leadership.